On the anniversary of the midnight destruction of the Chicago lakefront airport, Mayor Daley berates a reporter who called his strip of land Meigs Field. In the Mayor's mind, Meigs Field no longer exists. He wants to put in a park. It is one of his proudest accomplishments; under the cover of darkness a commando raid which his enemies could not block with a quick court injunction. Then he told a serious of white lies about his reason for bulldozing the runways: security against terrorism was one of those odd reasons. It probably was the fact that those commuter planes flew over his south Loop home. It is less noise than those suburbanites who are fighting the Mayor's massive expansion of O'Hare Field. But he who has power uses it. 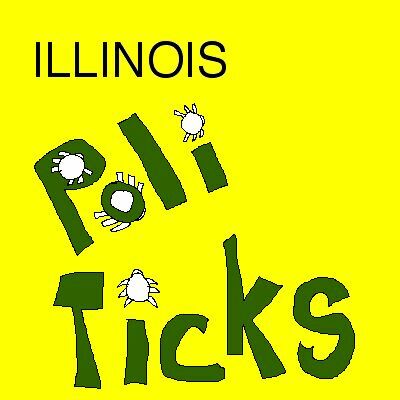 In the past year, Illinois politics has meandered down the crooked path of history. The face of the Republican Party, former governor George Ryan, was in federal court listening the the corruption charges filed against him. He had the constipated look of a lost basset hound. Illinois had a primary and none of the major candidates showed up to glad-handle the voters. Kerry had wrapped up the nomination a week beforehand; Bush ran unopposed. The races that were fiercely fought were for the soon-to-vacant US Senate seat of Republican Peter Fitzgerald. Thirteen candidates entered the two primaries holding for a plurality win. Tens of millions of dollars were spent on the senate primaries. Voter turnout was on the low end of normal. But in perspective, local General Assembly races were just as contested and thousands of dollars spent on usually uncontested matters. On the Friday before the election, a postal box in suburban Chicago contained 22 glossly 8 1/2 by 17 inch campaign postcards. Every candidate, from state senator to circuit court judge, buried the public with literature. The scramble for elected office is at a fever pitch. The reason is simple. Politicians make an extremely high standard of living and a more lucrative state pension that vests upon swearing into office. The legislators have set themselves up for multiple salaries, multiple pensions, and more money in retirement than they could running their own business or profession. All on the backs of the Illinois taxpayers. The state is running a projected $7 billion deficit. The first thing the new governor did was push a $10 billion bond issue which will cost $26 billion to repay in order to fund the state pension system, in essence, the politicians retirement funds. It is part of state tradition that politicians are the first to line up at the state treasurer teller. The state was founded on speculation, government script and schemes of increasing one's standing or class in society. Private gain from public service is the double helix of the career politician. It has become generational; father to son/daughter like some kind of feudal passing the castle keys. Political families now have the feeling that they are entitled to their public offices. And without any challenge to their authority, their power to control has been absolute. Which returns the spotlight back on the Ryan case. The current US Attorney is not a Illinois politician. His main job was to be apolitical; to ferret out corruption like the feds during prohibition. The Ryan case will lead to other indictments as the microscope is put on other public institutions and how political favors and kickbacks are the cost of doing business in this state.